Universe Today Search for any planet; learn the latest! The Wesak is a Full Moon Festival occurring during the sign Taurus. An ancient legend says the Buddha, for a brief period, renews His touch and association with the work of our planet at this time. The Festival of the Buddha releases forces of enlightenment from our highest spiritual planetary center, Shamballa. These forces spark initiation and are stepped down for humanity through the Buddha, the Christ and the Spiritual Hierarchy. The Wesak Festival, when the Buddha and the Christ come together in a sacred ritual, is spiritually known to be the supreme moment in the annual cycle. During Taurus we have the opportunity to tap into the channel of direct communication between humanity and Deity and celebrate the evolutionary blessings that come to all of humanity. It is important that groups of all faiths unite globally to invoke the divine in everyone. Together we are the Chalice, the Holy Grail on Earth, prepared to receive the outpouring of potent energies from on High. In 2011 the Full Moon during the sign of Taurus occurs Tuesday, May 17, at 4:09am PDT (11:09 UT). The Wesak Full Moon always occurs in the constellation of Libra. For a map and meditative reflections stay tuned for a Moon Dances link. Orion The Hunter is found with the winter stars sinking in the southwest at sunset. The stellar giant fully sets in the beginning of Taurus by 11:15pm and by its end at 9:45pm. Use Orion's stars to navigate this area of the sky. Orion helps one find the Winter Triangle and the Great Winter Hexagon. Sirius the brightest star in the heavens can be seen the southwest as the sky darkens. Sirius sets in the beginning of Taurus around 10:45pm and by its end at 9:15pm. Arcturus is the bright star high in the east at sunset. Use the handle of the Big Dipper to arc down to Arcturus from there spike down to Spica in the south. Helpful Image In 2011 yellowish Saturn lies above (west of) bluish Spica; both are located south of golden Arcturus. 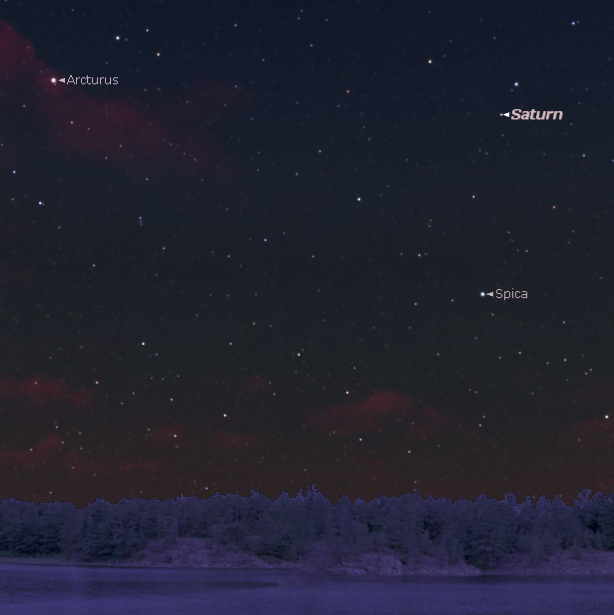 Look for the large triangle formed by these 3 colorful celestial bodies. Use this early April Map to see how the triangle relates to blue-white Regulus of Leo the Lion. The westward movement of Arcturus and the Big Dipper can be observed until sunrise. Big Dipper Navigation Notice the seasonal position of the Big Dipper's bowl. Vega is the very bright star rising above the northeast horizon after sunset.